Thanks to the Japan Foundation, I’m reading Manga! Manga! 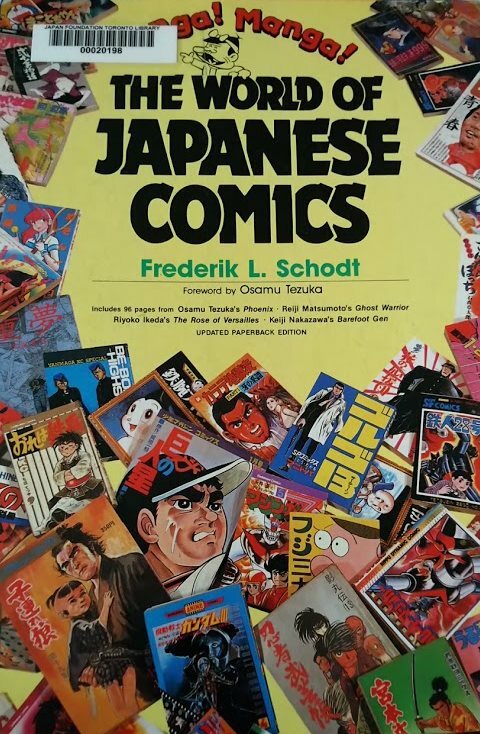 : The World of Japanese Comics by Frederik Schodt (and if you want to know what the Japan Foundation was like I tweeted about it here). It was published in 1986, well before the manga boom of the mid-90s. Or was it the late 90s? I can barely remember a time when manga wasn’t the default comic book format for the majority of readers, at least in terms of sales. So the book was written in a time when only specialists in Japan and the most dedicated of comic book hipsters knew anything about Japanese comics. It therefore explains manga from the ground up, going through its history and providing examples of manga of each era and type (mangas from the 50s, boys’ manga, girls’ manga, etc). It does the same thing that many comic book histories do in locating the origin of this mass market disposable entertainment in antecedent forms with greater cultural cachet but weak connections to the medium (i.e., I’ve seen people arguing that the Bayeux tapestry is also comics in that it combines pictures and words to tell a story). I understand why the comics historians do it, they’re trying to impart greater respectability to their medium by connecting it to older and more respected media, but I dunno, I think it’s more productive to define the medium by its relations of production and it stops you from going down ridiculous formalist arguments about whether magazine cigarette ads count as comics. Moving on, I hadn’t realized I knew so much about manga as I’d already heard of quite a lot of apparently obscure works, or at least they were obscure back in the 80s. Time marches on and Rose of Versailles, for example, has an anime that I watched on streaming a few months ago. And of course there’s the scanlation community, which has probably done as much to spread knowledge of manga as any official initiatives from various industry groups. The last chapter deals with manga’s future and in hindsight it completely failed to anticipate the explosion of overseas interest in the medium just ten short years later. In fact, it basically says that manga will probably remain a mostly Japanese thing, instead of something French schoolkids save their allowances for and whatnot. Anyway, it’s an interesting snapshot of a specific moment in time in manga’s history.